Podcast listeners are a highly sought-after demographic for marketers, largely because it’s composed of well-educated, social sharers who listen to exactly what they want, where they want, without waiting. Podcasts are free, easy to download and thanks to smartphones, more accessible. We live in a time where people are constantly multitasking and podcasts fit in well with this fast-paced lifestyle. Once considered a niche medium, podcasts are making it into the mainstream, engaging audiences on a level that in some cases far surpasses more established mass media. In fact, Apple has just surpassed 1 billion subscriptions to podcasts via their iTunes app. 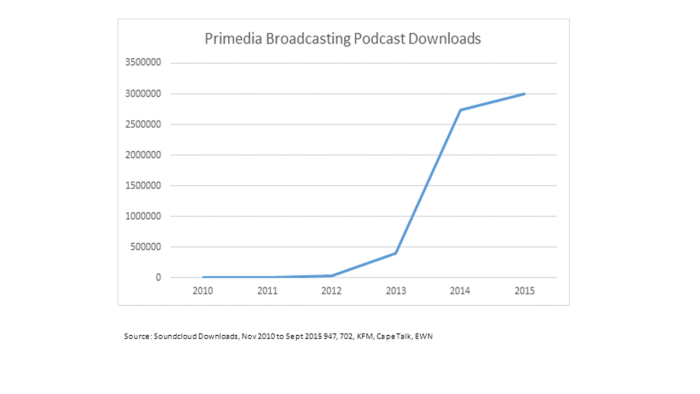 Primedia Broadcasting is making waves when it comes to podcasts with a sharp increase in downloads over the last few years. The top podcast in 2014 was that of KFM’s Ryan O’Connor taking calls on what grandparents are called by their grandchildren with 81 200 downloads. In 2015, the top track was 702’s Xolani Gwala playing the Nkandla song with 56 500 downloads. Contact Samantha de Araujo at Primedia Broadcasting for details on the latest podcast opportunities available.